This White Powder Gold was made using a variation of the John Hudson method with crushed to a powder Rose Quartz, Organic Dolomite Lime, and reconstituted Dead Sea Salt Water. Rose Quartz is also called Pink Quartz or Hyaline Quartz, from the Greek hyalos, meaning "glass," and was referred to in antiquity as a Bohemian or Silesian Ruby. Prized for its powers of beautification, facial masks of Rose Quartz have been recovered from Egyptian tombs, thought by the Egyptians and Romans to clear the complexion and prevent wrinkles. 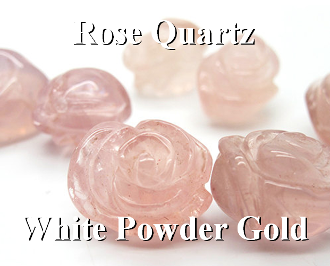 Rose Quartz was also a stone honored by the Tibetan and Oriental cultures, and continues to be one of the major carving stones of China.